Manufacturing Prints – View Types | Vista Industrial Products, Inc. Whether you are learning about engineering, manufacturing, or just need to brush up on your knowledge of dimensional prints, how to read a manufacturing prints is absolutely critical when it comes to fabricating a part. So to start with the basics, let’s ask the question, why do you need prints or drawings to manufacture a part? The sole purpose of prints is for visualization. It’s very difficult to have words explain what is required for a part. For example, if someone said “I want to make a 3 x 2 x 2 rectangle with one corner cut off of the rectangle and a hole through the center,” you would have many questions just based on this short description which seems like it should be fairly easy to understand. However, this description doesn’t describe the angle of the “cut off corner” and the exact location and size of the hole. The fabricator has to be able to fully visualize what the part needs to look like. In addition, drawings act as manufacturing instructions which include the dimensions, material type, and finish of the part. Prints are also used for verification once the part has been fabricated. The manufacturer will check the dimensions which should match perfectly with the print. Now that we have established the importance of prints, we will discuss how the part should be viewed. There are two types of views on prints, orthographic and isometric. Both are widely accepted and used for which best demonstrates the features of a part. Orthographic view shown below has multiple views of the part including the front, top, and side. This is most effective for sheet metal and machining parts because it gives you a rotational look at the part as if you were flipping it around on its sides. Note: this is the “cut off corner” described above. Next, there is the isometric view which is a 3D rendition of the part from one view shown below. This helps with visualizing the parts shape, but can be difficult to identify all features of the part since it’s only from one view point and doesn’t show the backside of the part compared to the multiple views like the orthographic view. 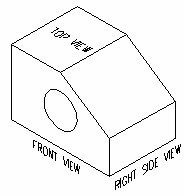 Many times, engineers will have both orthographic and isometric views on a single print which gives a full visualization of a part as shown below. This is extremely helpful for complicated parts that may seem difficult to interpret in the orthographic view and doesn’t present enough information in the isometric view. As seen in the image above, the visualization of the part is much easier to achieve with both types of views. The more information that will help visualize the part, the better. To learn more about prints, visit our Fully Dimensional Prints page or take a look at our How To Read Lines on a Drawing. It is important to note that the U.S. uses the Third Angle Projection view compared to Europe who uses the First Angle Projection. To learn more about the difference between the two types of methods, take a look at US vs. European Manufacturing Prints. Here at Vista Industrial Products, Inc., we specialize in precision sheet metal fabrication, CNC machining, welding fabrication, mechanical assembly, and metal finishing, so we have the knowledge and experience of what is required on a manufacturing print. If you have any questions, or if you are interested in having Vista Industrial Products fabricate your parts, please contact us today for a quote. This entry was posted in Drawings, Drawings 101, Engineering 101 and tagged blueprints, dimensional prints, drawings, manufacturing prints by Britney Blue (Payne). Bookmark the permalink. I would like you to comment on sheet metal drawings and how useless it is to use flat patterns to depict and dimenstion the finished part if you want to use the drawing to manufacture and inspect the finished part. Also, you might comment on how useless it is for designers to fret over the sheet metal bend setback K factor, a calculation that your software produces automatically. You might also explain to the novice why machined parts can be machine programmed from an iges file, whereas sheet metal parts cannot. Thank you for your great response. I have created a blog post that highlights each of the points you mentioned. The post is located here: http://www.vista-industrial.com/blog/sheet-metal-drawing-donts/. We always appreciate feedback and tips on topics to discuss, so thank you! Are the manufacturing blueprints enough to know the functionality of a device? This would depend on the product. If it’s a blueprint of a mailbox for instance, you would know what the functionality would be. However, if the blueprint is of a chassis only and no information on the contents or electronics going into the chassis, you would not know the functionality of the product.